Another winter season has come and gone. Winter in Alaska is a magical time of year. Our world is covered in snow white glistening crystals; a true winter wonderland. The aurora twists and turns overhead putting on a show for all who dare to stay up late. The entire sky is filled with sparkling stars waiting their turn to shine. Mushers race through the brisk night air behind howling dogs in delight. 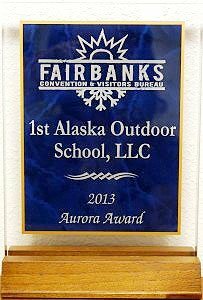 Those who brave a trip to Fairbanks in the winter are rewarded with an experience they will not soon forget. We are grateful for all of our guests who have dared to journey to this mysterious town for a winter adventure. As the snow begins to melt and the ice begins to thin, we start to prepare for Spring. The birds are starting to return to our fields, and the sunshine is kissing our cheeks well into the evening. It is with these changes that we have to say goodbye to the majestic dancing northern lights. As the temperatures start to rise, our sled dogs too will enjoy a summer vacation. While our world transforms around us from quiet and snow-covered, we will soon be rewarded with a landscape full of life. Flowers will bloom, animals will forage, and we will begin our next great adventure under the Midnight Sun.